People call me Fish Boy. My skin goes up and down like the waves. My mind goes in and out like the sea. They say I’ve always got my mouth open, that I ask too many questions. But what’s wrong with that? Billy’s got a lot on his mind – that he’d rather not think or talk about. So he watches David Attenborough, because Sir David’s asked all the questions and got all the answers, and swims in the sea, just letting his mind drift . . . 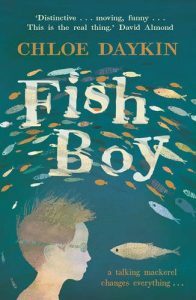 So when new boy and nature fan Patrick Green starts at school with ‘fingers like steel, strength of a bear’ and a mackerel swims up to Billy’s face, blows bubbles into his Vista Clear mask goggles and says: ‘Fish Boy’, Billy knows he can’t keep it secret, because . . . a crazy talking mackerel changes EVERYTHING. Distinctive . . . moving, funny . . . This is the real thing. With a comment like that, I itched to read this début novel. Add in the beautiful cover by Richard Jones, the fact it’s set in the North East and there are fish in it and I HAD to. It’s a lovely book just to look at – the cover shimmers and there are striking images and a playful use of typography inside too. You should judge a book by its cover in this case. The writing inside shimmers. 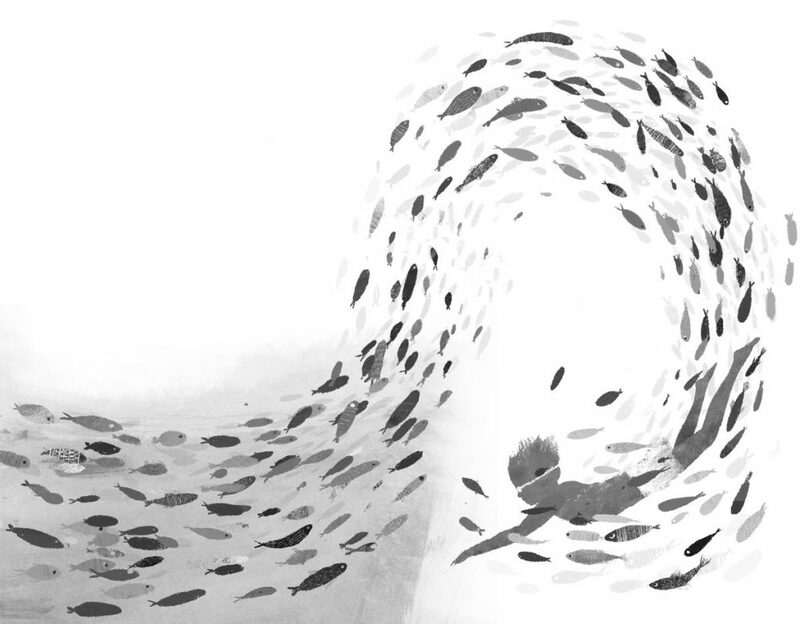 There’s playfulness and boldness to match – and yes, the talking mackerel does change everything. Read this if you are fascinated by the sheer marvellousness of the world. Read it if you enjoy the kind of ridiculous humour that comes from love and its twin, friendship. Read it if you like to swim alongside imaginative lads having strange escapades. Be prepared to snort with laughter – and maybe let the odd tear out. Convincingly written from Billy’s point of view, it has the warmth of Frank Cottrell Boyce. The modern day setting is lovingly evoked – and the mix of the every day and the extraordinary is a delight. I’d say competent readers from seven or so could dive in happily. Highly recommended for any readers who love almost-magic and adventure. This entry was posted in Review and tagged #ReviewMonday, review by KMLockwood. Bookmark the permalink.